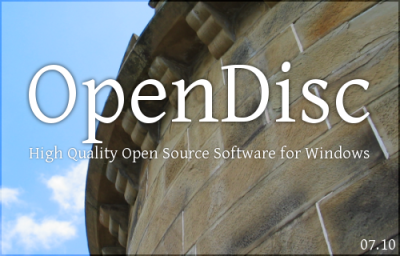 OpenDisc is a high qualiy collection of open source software (OSS) for the Microsoft Windows. All tools are great quality alternatives to similar costly software. The disc will be updated periodically as new versions of software are continually released, and users are encouraged to volunteer in a number of ways, including suggesting new software to add to future versions to translating the text into different languages.